Yeah, anxiety is a personal matter for me. My Dad struggled all his life with it. And, he laboured with it at a time when you didn’t talk about “those things” especially as a man. He went through life with an undiagnosed anxiety disorder. And I watched him suffer. Naturally, he passed it on to me. And for a long period of time I also struggled. It required discipline and commitment to get past it. Did you know one in four people suffer with anxiety? And many don’t recognize it. As an anxiety psychologist I see firsthand the different ways my clients experience anxiety. Its different forms range from physiological symptoms such as tension, tightness, shortness of breath to that cognitive chatter that focuses on worry and disaster and won’t let go. It’s normal – we are hard-wired for it. Sometimes we even seek out activities that trigger that anxious arousal– the thrill of riding a roller coaster or watching a suspenseful movie. It’s adaptive – sometimes you are supposed to feel anxious – like when you are writing an exam. And a little bit of anxiety helps you perform better. It acts like a warning system for danger. But it’s not dangerous. It is however, uncomfortable – sometimes really uncomfortable. It’s a problem when the warning system tells us there is danger when there isn’t. It’s like a smoke detector. You want that smoke detector to go off when there is a fire. But there is a problem when it’s going off and there is no fire. The challenge with treating anxiety is that you have to first explore how the anxiety symptoms show up. For many of my client it shows up as anxious thoughts. It’s that chatter in your head that creates doubt and feeds that feeling of fear. 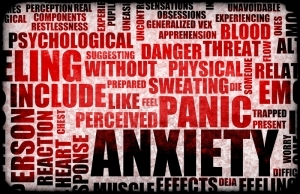 Anxiety symptoms and attacks are common yet many people don’t recognize anxiety. Fortunately psychological counselling can offer solutions. It can help you learn strategies for what to do with anxious thoughts. And even more importantly what to do to help your body let go of built up anxious arousal. There are some basic things you can start to do on your own. You can see my “top ten checklist for getting relief from anxiety”. Those strategies are a good start. I wish my dad had known about them. And I wish he would have gotten the help he needed and deserved. His life would have been a little easier. And me – well, I did get help. It took time for me to get the results I wanted. But it was worth it. So if you are in that place where you might need a helping hand from someone else to support you taking the next step down that road to relief feel free to give me a call. I have years of experience as an anxiety psychologist and counsellor and I’d be happy to help. Dr. Janice Stuart is a highly experienced therapist and counsellor, located in downtown Vancouver for your convenience. She offers services for a variety of issues and problem areas, including anxiety, depression, grief and loss, low self-esteem, relationship issues, and goal-setting. Her holistic-spiritual approach is ideal for clients who are feeling adrift and unhappy without clear direction or goals.